Railway Preservation News • View topic - "Toonerville Trolley" Kiddie Ride: Any History? "Toonerville Trolley" Kiddie Ride: Any History? 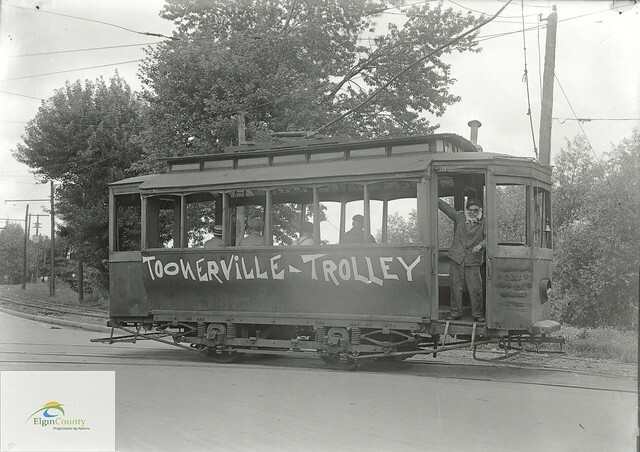 Post subject: "Toonerville Trolley" Kiddie Ride: Any History? The Baltimore Streetcar Museum's latest "streetcar" acquisition is actually a 1957 trolley....... well, sort of! This "Toonerville Trolley" children's amusement ride, much like electric kiddie cars, horses, and rocket ships popular in the 1950s to 1970s, gave a child a minute or so of excitement for a coin. The unusual aspect of this is that Bally Manufacturing, famous for pinball games and other arcade amusements, introduced it in 1957, two years after the popular syndicated Fontaine Fox cartoon panel ceased production upon Fox's retirement. This model is said to have been exceedingly rare even when built, and most of the Internet search hits are ads for used units for sale in gaming trade magazines of the era. This example surfaced at a local auction, having been converted to operate with an on/off button for a private owner's basement. It was acquired by a BSM member and donated to the Museum as an example of the trolley in popular culture. It is missing its characteristic trolley pole and needs restoration, but it does operate--roughly, just like the Toonerville Trolley supposedly did! Does anyone know anything more about these units, or know of another in rail preservation anywhere? Photos, manual, etc. sought. Photo by Andy Blumberg, BSM. Post subject: Re: "Toonerville Trolley" Kiddie Ride: Any History? I guess you drop a coin in and it shakes rattles and rolls stationary with sound effects. What gauge is that? Reminds me of the Wolf and Dessaur Live steam train at christmas in the store years ago. Congratulations. That is a really special find. You drop in a coin (we think a dime), and the trolley lurches, shakes from side to side, rocks, and bounces just like the comic strip prototype of legend! The BSM example is indeed a lurching action; they might worry about wear on the floor under the base! The one online report of a second surviving unit I can find suggests that the action is so rough and violent that no one fretting about liability and insurance would offer to let a little kid ride it today! I wonder if the motion has changed due to power supply? Was the power supply in 1957 the same as today? USA today is what, 120 volts? But it always used to be called 110 volts. Will the unit have a softer ride if the power is a little weaker? My parents used to tell stories about living in a building with DC power. One of the studios made a live action short of the Toonerville as well. 110 and 120 are close enough. Since the Toonerville Trolley cartoons are in the public domain, they could be screened on a large screen TV in front of the ride while the kids are seated in it. Definitely a way to keep little ones amused while parents peruse the gift shop. 1) There are hydraulic snubbers to cushion the ends of the motion, and they have either gone dry over the years, or the seals are shot. 2) there were rubber blocks to act as stops that are missing. I remember those coin operated rides from my childhood. The rocket, automobile, and cowboy horse (I don't recall ever seeing the trolley) all seemed to share the same motion; a forward surge followed by a rock back that seemed to be driven by a cam follower; no jolts. I can't see a separate different mechanism just for the trolley, but of course it is possible. It could be that the attachment of the cam follower to the ride body is loose, allowing the body to flop around. According to what few anecdotal reports we can find, the ride was SUPPOSED to be rough. The Toonerville Trolley was supposedly a jerky, spastic contraption, after all. There's also one report that the handles we see in the cab actually did exert some form of control over the ride. We have no idea yet if that is true or wishful thinking, and I myself haven't examined the Museum's ride closely enough to see whether those handles link to, or did link to, anything. I think you have a rare find there. I've never seen one. As I understand it, and as mentioned previously, these were meant to be a bit jerky in operation. Per the image found here, https://www.terapeak.com/worth/bally-kiddie-rides-toonerville-trolley-traffic-police-motorcycle-advertising/162295802554/, the "Motorman controls the speed" which may have been controlled by one of the two rotating handles. The operators price list listed it for $835 in 1958. Finding manuals might be pretty tough due to limited production though this shouldn't be complicated mechanically or electrically so you may be able to get by without the manuals. I have older electro/mechanical pinball machines and you definitely need manuals for help chasing the miles of wire or repairing circuit boards. The coin box should be a standard Bally 10 cent timer box that someone bypassed with a switch - not uncommon and should be easy to revert back. Value? No clue. Seems the popular, mass-produced ones go from $1,200 and up unrestored. You should do a bit more research on vintage coin-op kiddie rides in general before you restore the cosmetics - sometimes the patina on a rare piece makes it more valuable. I hate to be a spoil sport, but maybe it is too valuable to continue giving rides?